and no one’s forgotten by his brothers. Victor Montejo is a poet, a human rights activist and an anthropologist, studying in depth his own people. After the massacre of his village in 1981, in which Guatemalan soldiers killed his brother, Montejo’s name appeared on a death squad list and he was forced to flee to the US. Since then, his life’s work has been to make known, in a variety of ways, the continuing human rights violations confronting the Mayan peoples. in the cone of the great volcano? will return to the afflicted. This is really good advice. 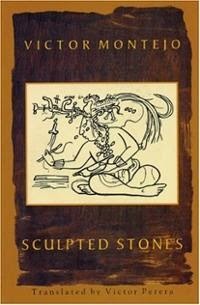 Sculpted Stones is testament to a people’s tenacious determination to survive in the face of centuries of colonization. Highly recommended.